High-street health chain Holland & Barrett has announced the launch of a range of low-calorie own-brand ice-creams in a variety of tempting flavours. The vegan ice cream market is set to surpass a value of $1 billion by 2024 with large dairy ice-cream producers such as Ben & Jerry’s, Cornetto and Häagen-Dazs keen to get a scoop of the action with the launch of vegan and dairy-free ranges. Keen to get a scoop of the action, high-street health chain Holland & Barrett has announced the launch of a range of own-brand ice-creams in a variety of tempting flavours. In a bid to rival other low-calorie brands such as Halo Top, the health food and supplements retailer has launched peanut butter, passionfruit and salted caramel flavoured frozen desserts that contain less than 140 calories per serving. 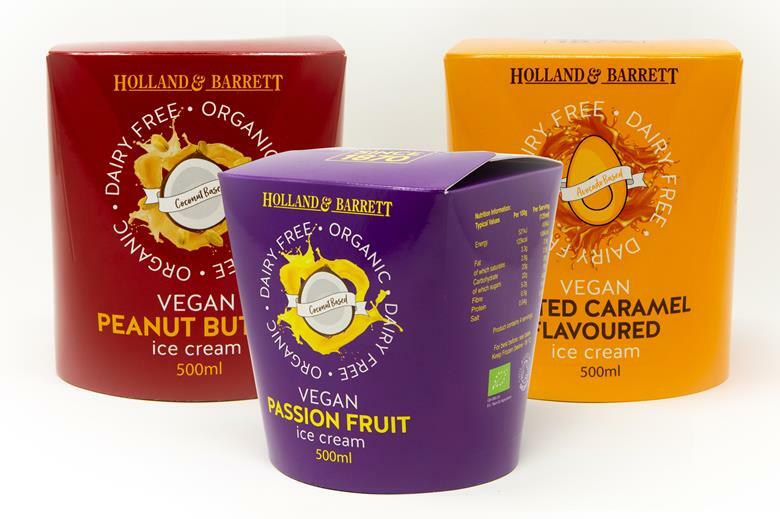 The frozen treats, which will retail at £3.99, are dairy-free, gluten-free and organic, and while the peanut butter and passionfruit variants are coconut-based, the salted caramel flavour is made using avocado to give a creamy and smooth texture. Not only are the ice-creams low calorie and vegan, but the retailer has also sought to make the packaging as eco-friendly as possible by using a sealable top rather than a separate lid to reduce the amount of packaging needed for each tub. Holland & Barrett has launched the range in all 715 UK branches with a buy one get one half price promotion.